No longer playable due to the servers being shut down on March 1, 2016. No longer sold digitally as of August 23, 2013. Retail editions of the game. Contains special pre-order items along with unique in-game content. Digital edition of the game distributed by EA. Contains the same unique items as the limited edition along with a unique special hero called Meditron. All save game data was stored online on Maxis/EA's servers. 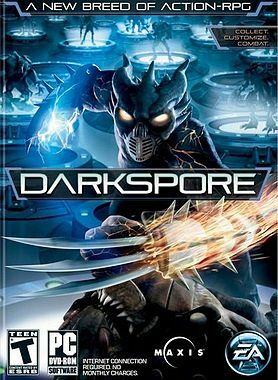 Darkspore has been shown to work on multiple monitors, though it is not officially supported. 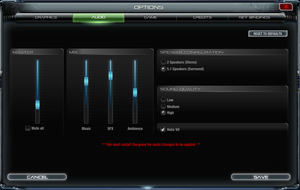 "On" or "Off"; no additional settings. Brightness can only be set while in fullscreen. Use -r:widthxheight for example -r:1920x1080. Make sure your computer is running at your non-standard resolution (e.g. multi-monitor setup). Start Darkspore (it will launch in its default resolution). 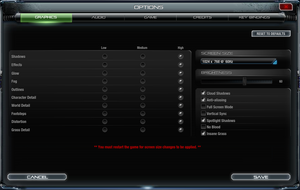 From the in-game options set the Screen Size (resolution) to one of the resolutions available. Only keys can be rebound, not all keys can be used. Attacking on left click can be disabled. Stereo and 5.1 Surround sound are available. A re-install is required to change localization. Affected users will find that they can start up Darkspore, but attempting to log into their account will fail, displaying error code 73003. Error 73003 was a long-standing, login issue with Darkspore that affects only specific users and has resisted multiple fix attempts by Maxis. The exact cause is unknown, though the Error Code's description as provided by Maxis to the Official Darkspore Forums' Community Moderators is "Unable to login to sporenet". The error has been fixed for some users in the past following server updates, but at the same time, others users have found themselves become affected by it. All testing by the community so far leads to the issue being account side on EA/Maxis' end. In each of the following cases, an account unaffected by Error 73003 was tested and was able to log in. Uninstalling Darkspore, removing all user data and then reinstalling it. Attempting to log in on a different computer on the same network. Attempting to log in on a different computer on a different internet connection. Assuming that Error 73003 can affect players attempting to play the demo, players should download the Demo before purchasing Darkspore and should check that they can play the demo on their account. If they cannot, they should create a new Origin account and attempt to log into Darkspore with that account when playing Darkspore. This process should be repeated until an account is not affected by Error 73003. The player should then purchase Darkspore for this account. A number of players have talked about how they have contacted an EA Game Advisor complaining about being affected by this error. A lot claim to have received money off of other games and in some cases, full games of similar value when trying to obtain a refund for their purchase. These claims cannot be confirmed however. Make sure your computer's clock is correct. Wait a few minutes to see if Darkspore will resolve the issue itself by contacting Maxis' server. If the above fails, download the newest patcher/launcher from ea.com. This occurs when Darkspore is installed into a folder that your user account cannot modify. Right click on Darkspore.exe or your shortcut to it and "Run as administrator". Reinstall Darkspore to a location that does not require administrative privileges to modify. This occurs when there is something invalid with your account details, likely an invalid date of birth. Follow the EA Answer HQ guide to contacting a game advisor to get them to fix your account details. 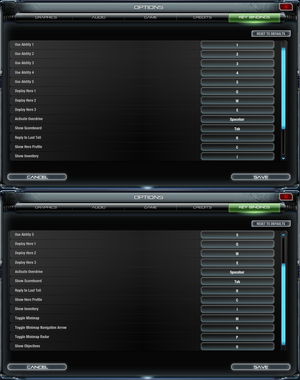 A lot of forced graphics settings do not play nice with Darkspore and can mess with Darkspore's graphics. Ensure that your graphics drivers are up to date. Set all Darkspore graphics settings to "Application Controlled"
For AMD graphics cards, open Catalyst Control Centre and go to the Gaming tab. Either change all the System Settings to "Use Application Settings" where available, or create individual application settings for <path-to-game>\Darkspore\DarksporeBin\Darkspore.exe. For Nvidia graphics cards, open the Nvidia Control Panel and set all settings for <path-to-game>\Darkspore\DarksporeBin\Darkspore.exe to 'Application controlled' where available. Originally, logging into Darkspore with an account that does not have a Darkspore retail key registered to it, would open an in-game web browser displaying a page where you could activate your retail key or cancel. This page is no longer available. Launch and log into Darkspore. Redeem your retail key (serial code) in Origin, see Redeem Your Serial Code In Origin. Once done log back into Darkspore with the account you redeemed the key on (you may need to restart Darkspore). The server performs validity checks when saving your heroes and will refuse to save them if it finds a problem not picked up by the client. Supposedly an issue with memory when you have a very high number of parts/details. If you have sold items in the buyback section, clear them by starting a mission and then quitting back to the Arsenal. If still not fixed, sell unequipped parts and details to lower your total number of parts/details (you will need to clear the buyback section once done). In the editor, reset the hero that is failing to save. A persistent internet connection is required at all times. ↑ File/folder structure within this directory reflects the path(s) listed for Windows and/or Steam game data (use Wine regedit to access Windows registry paths). Games with Steam Cloud support may store data in ~/.steam/steam/userdata/<user-id>/99890/ in addition to or instead of this directory. The app ID (99890) may differ in some cases. Treat backslashes as forward slashes. See the glossary page for details. This page was last edited on 7 November 2018, at 02:17.